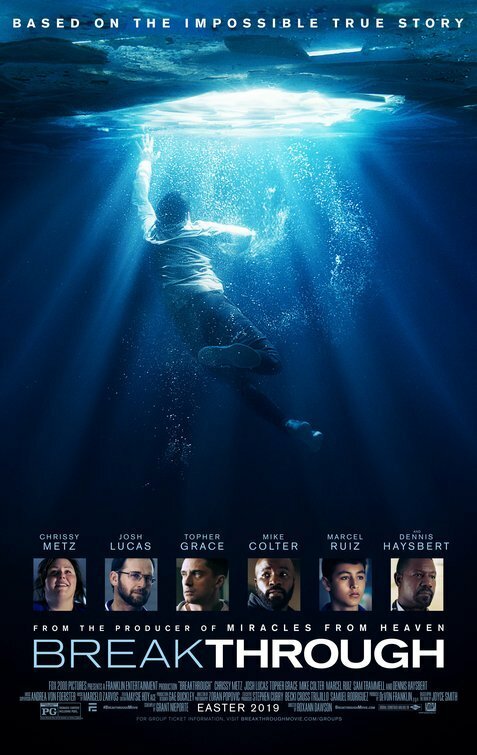 "Compelling, Heartrending, Miraculous Story of Grace"
BREAKTHROUGH is a must-see, entertaining, powerful, convicting, heartrending story about the real-life incident of a boy who fell through some ice and had no pulse for a longer period than any doctor thought possible. When his mother prayed over him, everything changed!Do you have a story about answered prayer? BREAKTHROUGH is a must-see, entertaining, powerful, convicting, heartrending story about the real-life incident of a boy who fell through some ice and had no pulse for a longer period than any doctor thought possible when he then miraculously revived. Each character, believers and unbelievers, undergoes a tremendous journey in BREAKTHROUGH, an inspiring movie that will make you laugh and cry. BREAKTHROUGH is a must-see, entertaining, powerful, convicting, heartrending story about the real-life incident of a boy who fell through some ice and had no pulse for a longer period than any doctor thought possible when he then miraculously revived. Each character, believers and unbelievers, undergoes a tremendous journey in BREAKTHROUGH. The movie opens with a boy drowning under the ice and then cuts to a montage of the characters involved in this powerful story. Then, it cuts back to the time before the accident when John, a young boy, is rejecting his adoptive parents and his schoolwork and only appreciates basketball. His mother, Joyce, is very concerned about John and tries to get him engaged in little activities such as blessing his food, eating his eggs, doing his homework, and responding to her kindness. However, John is withdrawing more and more into himself. At a Christian middle school, John tells his teacher he hasn’t done the homework, that all he cares about is being on the basketball team, where he proceeds to fight with some of the other teammates. Viewers find out that John was adopted when his parents went on a mission trip to Guatemala. He’s surly because he’s hurt that his real mother abandoned him. Joyce smothers John with love because she got pregnant out of wedlock when young, gave up her baby for adoption and blames herself every day for doing so. The father is the calming force in the family. Joyce is also angry at the new pastor in the church. He makes her women’s prayer group move out of the boardroom, he brings modern music into the church, and (worst of all) he has a bad haircut. On the fateful day, John and two of his friends start playing tag on an iced over pond near their St. Louis home. The ice breaks, and John sinks to the bottom, while the other two try to survive. A man calls 911 and the fire rescue team, and the police help the two boys while two fire rescue team members search for John’s body, Just when everyone’s willing to give up, one fireman thinks he hears the fire chief tell him to go back to a specific place under the ice. Tommy, the fireman, is convinced he’s heard this voice, but later everyone says they never said anything. He does find John, and they rush him to the local hospital. He’s been out longer than anyone, beyond the point of survival, but there are signs he may be struggling to breathe. After John’s mother, Joyce, prays a powerful angst-ridden prayer to him in the name of Jesus in the power of the Holy Spirit, they send him to the best doctor in the world for these cases. Again and again, the doctors give up while Joyce and Brian wrestle with her faith and her anger. Pastor Jason goes the extra mile in spending time with John. If you paid attention to the news when these events happened, you know the rest of the story. Millions of people prayed for John. BREAKTHROUGH is a powerful story that will impact people’s lives and will answer some of the questions when about God’s intervention on behalf of some people but not others. Of course, that is the basic issue of the problem of evil, and the movie works through many of the answers in a satisfying, helpful way. BREAKTHROUGH is a breakthrough story in Christian filmmaking. It has some of the best character arcs of any movie, as well as an extremely well-written, well-directed story. Chrissy Metz does an excellent job playing Joyce, the mother. Every character is real, flaws and all. There should be some caution for little children because of the ice scene, and the pain of adoption. Otherwise, however, BREAKTHROUGH is a must-see move. It will make you laugh and cry. Surly son, angry mother, resentful teacher, and other negative characteristics are resolved through the power of the Gospel. BREAKTHROUGH opens with a St. Louis boy drowning under the ice. Flash back to the time before the accident. John, a young boy, rejects his adoptive parents, neglects his schoolwork and only appreciates basketball. One day, John and two friends play tag on an icy pond. The ice breaks, and John sinks, while the other two try to survive. The police rescue John’s friends while two firemen search for John’s body. Just when everyone is giving up, one fireman thinks he hears his boss tell him to return to a specific place under the ice. He miraculously recovers John’s frozen body, but it will take another miracle to bring John back to life. BREAKTHROUGH is a powerful story that answers some of the questions about God’s intervention on behalf of some people but not others. BREAKTHROUGH is a great, extremely well-directed story. Chrissy Metz does an excellent job playing the mother. Caution is advised for little children because of the ice scene and the pain of adoption. Otherwise, BREAKTHROUGH is a must-see move. It will make you laugh and cry.